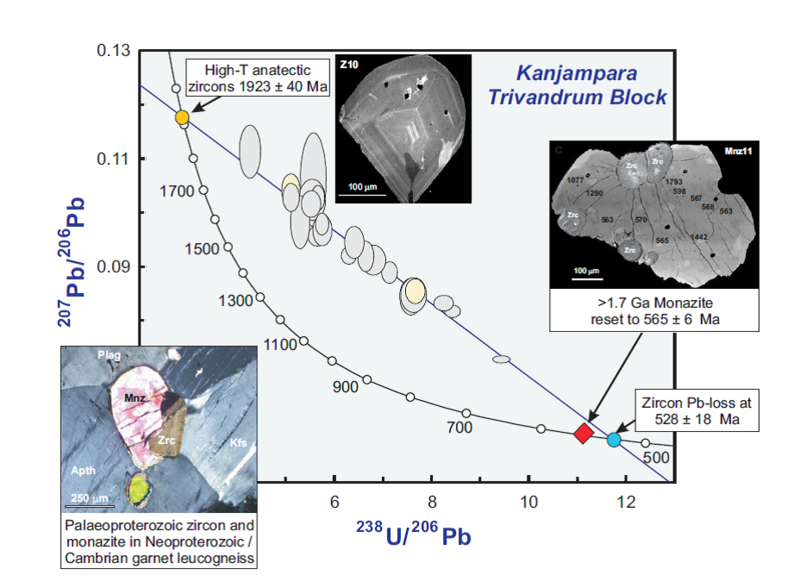 In-situ zircon U-Pb isotopic ages obtained on a garnet + cordierite bearing leucosome in migmatitic paragneiss at Kanjampara in the Trivandrum Block, demonstrate zircon crystallisation from melt at 1.92 ± 0.04 Ga. The unique trace element chemistry of the zircon, including high U/Yb, low Th/U, and flat MREE-HREE patterns with pronounced negative Eu anomalies, coupled with the presence of inclusions of sillimanite, apatite, quartz, feldspar and rare biotite in the zircon, confirms its formation as a result of anatexis associated with a high-T metamorphism at 1.92 Ga. This conclusion is supported by the local preservation of Palaeoproterozoic chemical age domains (820-860ºC. The strongly REE-P zoned garnet present in the Kanjampara leucosome, which is demonstrated to not be in HREE or Eu equilibrium with the 1.92 Ga zircon, formed as a result of anatexis and melt interaction during this Neoproterozoic-Cambrian tectonothermal event. Th-U-Pb chemical age data indicates that monazite was either formed or extensively recrystallized at during this anatexis at 565 ± 6 Ma, undergoing further modification to form high-Th cuspate rims at 517 ± 15 Ma. The age of the final monazite chemical modification is equivalent to the lower intercept age of 528 ± 18 Ma for extensive Pb-loss from the highly discordant but otherwise well-preserved Palaeoproterozoic (1.92 Ga) zircon. The growth or recrystallisation of monazite at ca. 565 Ma and its further modification at ca. 520 Ma indicates that the high-T metamorphism in the Pan-African was long-lived, with a duration of at least 45 Myr. 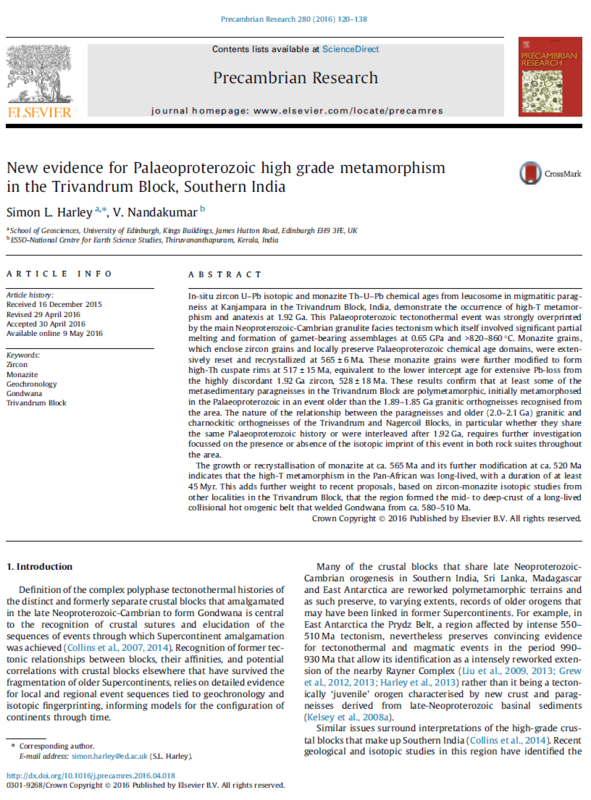 The new age-event results from Kanjampara confirm that at least some of the metasedimentary paragneisses in the Trivandrum Block are polymetamorphic, initially metamorphosed in the Palaeoproterozoic in an event older than the 1.89-1.85 Ga granitic orthogneisses recognised from the region.